For something completely off-topic, here's a niche service that couldn't have existed prior to the Internet. 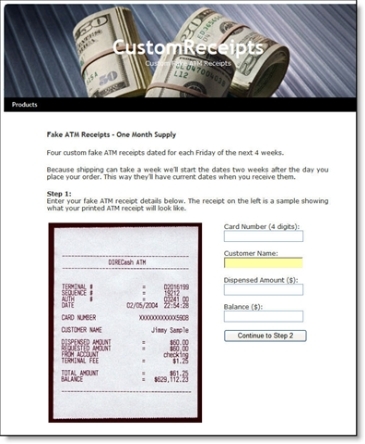 Four-year-old Custom Receipts.com (screenshot below, link here) will create a year's worth of personalized fake ATM receipts. For $15 + $1.50 shipping, with payment via PayPal, you receive 52 ATM slips printed on thermal paper and dated every Friday for a year. 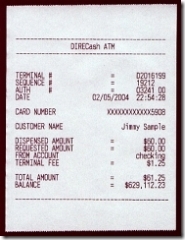 The receipt includes your name, the last four digits of your account number, a withdrawal amount and closing balance of your choosing. The example shown on its homepage shows a balance of $629,112.23 with a paltry withdrawal of $60 (see inset above). They ought to up that to at least 3 Benjamins for credibility. At $15 per order, the site operator won't get rich, but it's a clever idea and hopefully all in good fun. In an email exchange with the owner, who prefers to remain anonymous, he said that he previously offered to produce any personalized receipt. Intended to be used as a joke, he shut down the service after receiving numerous requests for items obviously intended to defraud employers or insurance companies.